Once you’ve logged on, look for the Notebook Navigator on the left side of the screen. Once selected, a new window will appear asking you to name your new Notebook. You should also choose a folder layout (none, Lab, Classroom, or from another notebook). Add a name, select a layout, then click Create notebook. Each folder layout (lab, classroom) has a number of folders which you can use, rename, move, or delete based on your needs. You can also choose the “None” option if you would prefer to create your folder structure from scratch. Click on + New… in your Notebook. 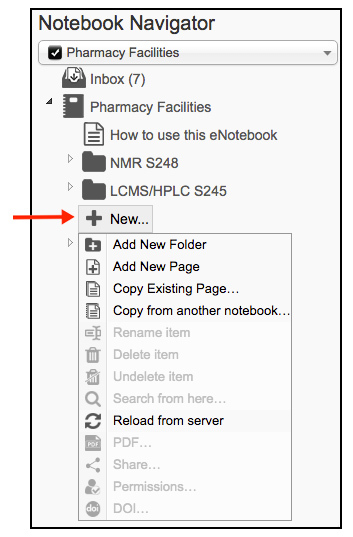 Choose Add New Folder, Add New Page, Copy Existing Page or Copy from another notebook. Give the new item a name. Folders can be created within other folders. Folders and pages can be dragged and dropped to wherever you want them to go. 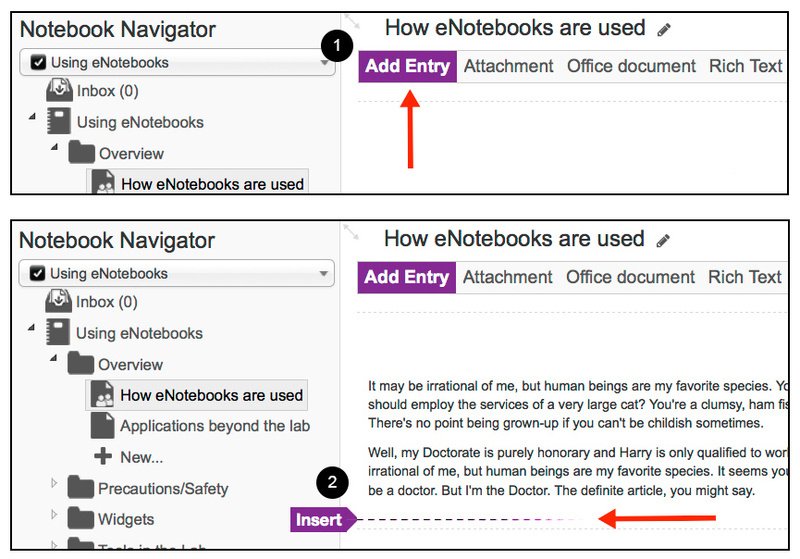 Information is added to the pages of eNotebooks as “entries”. The “Insert Entry” toolbar at the top of the page/between existing entries. Note: if you have your Accessibility Mode switched on, you will not be able to insert entries. Click the menu labelled with your name in the top right corner of your window and then Disable Accessibility Mode in order to utilise this function. Rich Text entries are the most common type of entry. Use the accompanying toolbar to format text, make simple tables, add images and web links. Attachment entries are for uploading files from your computer. Any file format can be uploaded. If a Microsoft Office document or a PDF has been uploaded, a preview will display. Most image formats—such as .jpg, .gif, .tiff, .bmp—will also display a preview. Note: The fastest way to transfer existing files to your Notebook is by dragging and dropping them onto a Notebook page; such files are added as Attachment entries. Office Document entries allows the user to create and edit Microsoft Office compatible documents, including Word, PowerPoint and Excel files. To edit an entry, move the cursor over the entry and select the appropriate tool from the menu that appears. 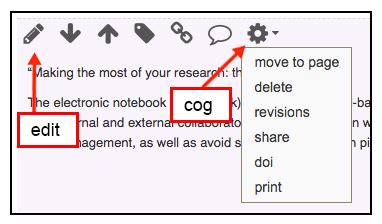 Deleting and moving an entry to another page are listed under the cog symbol when hovering over the entry.